I'm having to post these teasers in this thread as I cannot log in to the Gallery (password reset sent - may also need to do same for username as still not working). 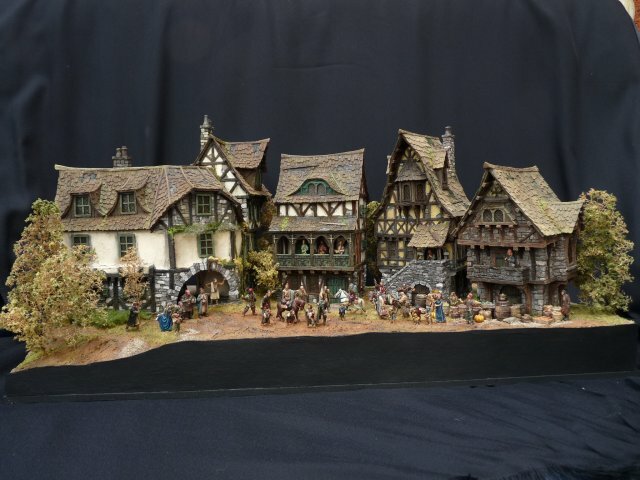 This, by default, will also be submitted to the Tabletop World competition, however this was secondary as a series of dioramas depicting scenes from LotR was planned long before I became aware of TTW - the competition was what I needed to get the proverbial 'finger out' and get on with it! . I have has to use considerable artistic license with The Pony especially as the Inn from TTW although it has an arch is in fact much too small for the Pony hence trying to hide 'lost' size with trees. I did convert it to have three stories though. For my diorama project this is not in fact a completed piece as I need to add a scenic backdrop and make a box for it as there will be two, possibly three further smaller scenes (including the interior of the Pony) that will make this 'set'. Wonderfull. I have seen more pictures at facebook and I love them. You will need a bigger house now for you and your dioramas. This incredible again David. I love the colors chosen, the tavern conversion is a great add-on. Even the mud at the front is perfect. Bravo! This really is excellent, Master Ddaines, the skilled artisan ... and quite large with so many detailed figures in it. Thank you for providing those pictures here. So glad it's almost over , just have to muster the enthusiasm to complete the accompanying dioramas to complete my original idea. I may just need a small break though . I can only say good luck with your entry Sevlag - very well done and detailed. I will try and get some more images in the Gallery once I have managed to re-log in. Good luck to both of you David and Sevlag on the Table Top competition!!! I will be honest. I don´t like the buildings. Sorry, it seems, that I am the only one. Too much details for the "mithril-style". But this is only my taste. also the composition. And especially the high painting standart- as usual, Master Dave! , A second house would indeed be very helpful Chris, maybe a castle would be even better . Re the buildings, an honest opinion is always welcome - TTW stuff is extremely detailed, almost like a scaled down builder constructed them. I have to admit I do like them a lot, but each to their own . Some 'other' figures arrived today which do appear to be very nicely detailed, so I will see how they look with another TTW building I have. This is beyond excellent! 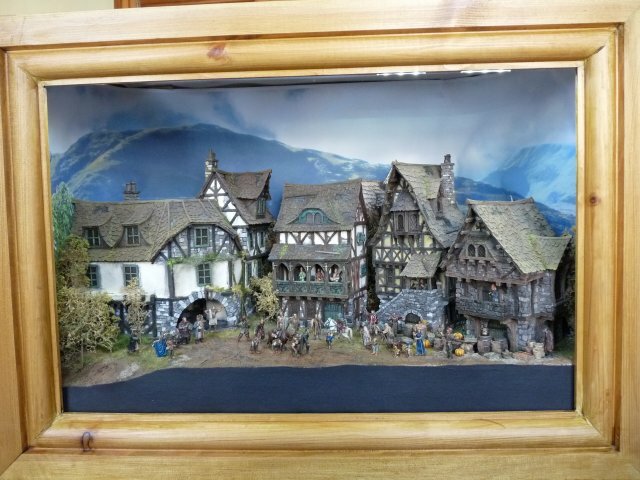 Your skills in diorama building are some of the best I have seen, David. You never fail to amaze me with your work! I don't think the houses are too detailed, or that the painting would lift forth too much detail. They look rather realistic to me. Well finally finished this one (albeit a couple of weeks ago now) and lots of lessons learned! I had considered a hand-painted backdrop, but wasn't happy with the result and as I had a show deadline looming I had to go with something already printed. The scene is now lit from within (I did create an aperture at the top to let light in, but it was ineffective). The frame isn't as warped as the image suggests, I blame the camera lens . Looks pretty awesome, but its a shame its so small. Cant really see the details! Fantastic! Could we beg to see some close-ups of the figures? This background is a great add-on to your greatest diorama David. Merci et Bravo ! 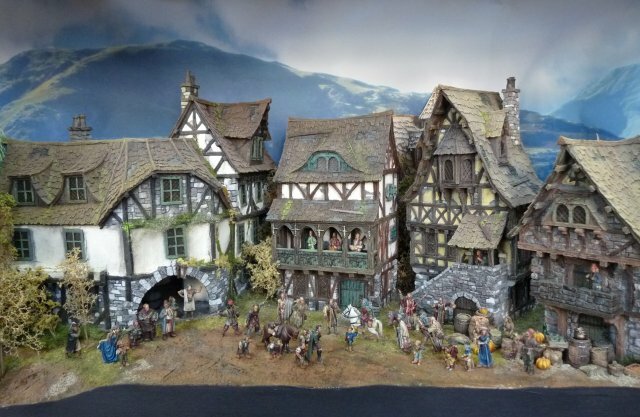 Once I saw a lot of pics showing details of that absolutely marvellous diorama, can't remember where. Wasn't it in connection with an exhibition? I also think that the two pics here are a bit too small. Furtheron I'm slightly irritated about the foreground which shows an irregular dark area I cannot identify. 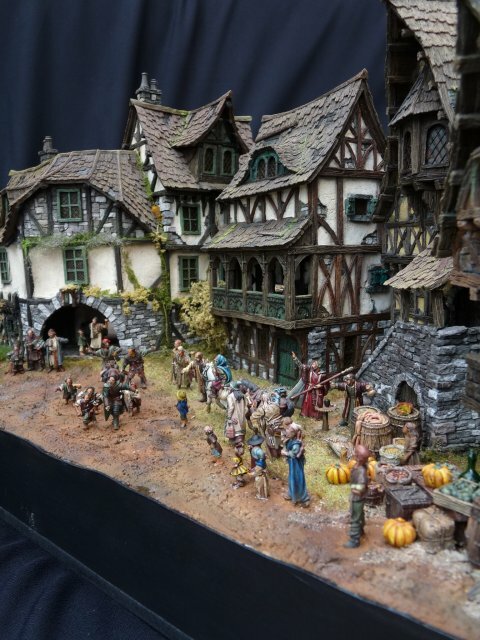 As I told you before.... it is really beautiful diorama, dear David..... really beautiful !!! Some of the images may be better viewed at http://www.mithril.ie/PBPhotos.asp pages 3 - 5 of my gallery on the Mithril galleries under David Daines. The black irregular bit at the bottom Master Tree is from when it was a 'stand-alone' diorama and it wasn't definite (although intended) to build the box. Had I been Master Archer, the planning would have been better . Great detail, thanks for giving us that link.